Singer Akothee has denied that she was arrested in Turkana while helping fight off starvation which has been killing Kenyans in Northern Kenya. According to the controversial singer, people have been spreading rumours that she was taken into custody for heading to Turkana to save lives. The government initially had denied that Turkana residents were starving to death. Welcomed Akothee, in an instagram post, said that she followed protocol before heading to Turkana for the charity gig. She said she was even welcomed by the commissioner of the county upon arrival. “Someone tell my mum that I am safe and in the hands of the government, some malicious people made my mum paranoid that I was going to be arrested , just to let you know , there was procedure that had to be done before I left for Turkana, we had to write a letter to the National government & county government , which was approved and I was accorded with state security who took care of me the whole time in Turkana , the state security was kind and very patient with us . ” I was welcomed by the COUNTY COMMISSIONER MR WAMBUA head of National government @ county Level , & the CS Turkana county , it was so painful , that I received several calls from people asking me to go back to Nairobi and that I was going to be arrested, the situation brought tension & trauma to my crew members , I had to block my mom because she would not understanding or listen to me,” shared Akothee. 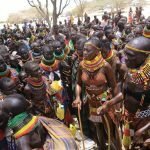 The post “Someone tell my mum that I am safe” Akothee denies being arrested for while in Turkana helping starving Kenyans appeared first on Ghafla! Kenya.